Submit the following form, and a member of our team will reach out to answer your questions or schedule an appointment. What procedure would you like to discuss? 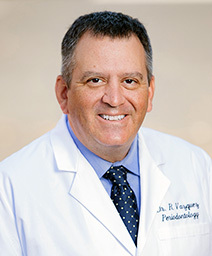 Dr. Vazquez has been practicing periodontics for nearly 20 years and has placed thousands of dental implants. Dr. Vazquez stays fully up-to-date on all the latest technologies and procedures in periodontics. Dr. Vazquez's experiences and training enables him to successfully treat even the most complicated cases. Dr. Vazquez's love is implant dentistry and he enjoys helping patients recover to full oral function through replacing their missing or broken-down teeth. He uses the latest 3D CT scanner and 3D software to assist him in preparing the implant surgery ahead of time, so that on the day of surgery, any extractions, bone grafting (as needed) and implant placement is accurate and very smoothly executed. With his deep experience and training he also knows what to look out for during surgery, and how to handle any complications in the unlikely event they should occur. Dr. Vazquez has a great deal of experience in all dental implant procedures, including New Teeth in One Day, the All-on-Four technique and full mouth reconstruction using dental implants to support dentures or dental bridges. Dr. Vazquez is married and he and his wife Debbie have three beautiful children Zoe, Gracie and Allen. He enjoys spending time with his family and he enjoys tennis,biking and skiing. When he has an opportunity he also enjoys traveling. Keila Smith Keila is our Dental Hygienist. Keila graduated in 2004 from Clayton State University with a Bachelor of Science in Dental Hygiene. She has two beautiful children. Keila enjoys spending time with her children, playing softball, and gardening. Kris Davis Kris is our Patient Scheduler and Financial Coordinator. She has been with Dr. Robert Vazquez since 2000. In her spare time, she enjoys gardening, home decorating, traveling and spending time with her four dogs. Shanda Horne Shanda is our Office Manager and Lead Surgical Assistant. In 2009, Shanda graduated from Columbus Technical College with an Associate of Health Science degree in Dental Assisting. She holds certifications as both a Certified Dental Assistant (CDA) and an Expanded Functions Dental Assistant (EFDA). In her spare time, Shanda enjoys spending time with family and friends. Lita Jones Lita is a Surgical Assistant. In 2017, Lita graduated from Columbus Technical College. She holds certifications as both a Certified Dental Assistant (CDA) and an Expanded Functions Dental Assistant (EFDA). In her spare time, Lita enjoys spending time with family and friends. Sedreka Singleton Sedreka is Surgical Assistant. In 2000, Sedreka graduated from Savannah Technical College with degrees in Health Science degree in Dental Assisting and Phlebotomy technician. She holds certifications in Radiology health and safety, Expanded Functions Dental Assistant (EFDA), AAMOS anesthesia assisting and ADIA anesthesia assisting In her spare time, Sedreka enjoys spending time with family and friends. Kimi Edwards Kimi Edwards has been a dental assistant since 2005, receiving her certification through the Dental Assisting National Board (DANB) as well as additional training as an Expanded Functions Dental Assistant. She is a graduate of Columbus Technical College with a Diploma in Dental Assisting and an Associates Degree in Health Science. Kimi has worked for Dr. Vazquez as his lead dental assistant since 2005. In 2012, she left to begin teaching dental assisting and to pursue her Bachelors Degree, which she received in Business Healthcare Management at Bellevue University. She is now back as the Co-Business Office Manager/Scheduling Coordinator. Kimi enjoys spending time with her husband of 21 years and her children! She also enjoys traveling, shopping, going to church, and a day at the spa! Columbus Dentist, Dr. Robert Vazquez is dedicated to implant dentistry such as dental implants, diagnosing periodontal disease and more. We are looking forward to your visit to our Columbus, Georgia dental office.